Welcome to my library on this last day of 2011! This week: Christmas Day, New Year's Eve and moving my mother. We had a restful Christmas Day, skipped church, and then drove all over town looking for a nice place for lunch. All our favorite restaurants were closed, but their employees deserved a holiday too. My husband and I plus half the town of Springfield found Elmer's open and enjoyed their Christmas special. A few of you know my mother Alice. I'd appreciate your prayers as she adjusts to her new home. Well, actually, she is not trying to adjust. She wants to move back to her apartment where she lived for twenty-nine years. Based on this length of time, I'm sure you can visualize the treasures and 'stuff' my sister and I uncovered as we cleaned her apartment. I'm thankful her new home is down the street from me. I know the staff will take good care of Mother and she will have fewer decisions to make. She loves walking, so I'll get more exercise this new year. New Year's Eve means I finish the book of Revelation and the next day I begin with Genesis again. I love reading the Bible through every year. Will you join me? You're always invited to tea in the library as we share 'bread' as secret Christians in China call their most treasured book, the Bible. I sincerely wish you all a New Year filled with meaningful relationships and contentment. comments? Email: folks7777@gmail.com or click on pencil below. "That night there were shepherds staying in the fields nearby, guarding their flocks of sheep. "Suddenly, an angel of the Lord appeared among them, and the radiance of the Lord's glory surrounded them. They were terrified, but the angel reassured them. "Suddenly, the angel was joined by a vast host of others—the armies of heaven—praising God and saying, "Glory to God in highest heaven, and peace on earth to those with whom God is pleased." "When the angels had returned to heaven, the shepherds said to each other, "Let's go to Bethlehem! Let's see this thing that has happened, which the Lord has told us about." "They hurried to the village and found Mary and Joseph. And there was the baby, lying in the manger. "After seeing him, the shepherds told everyone what had happened and what the angel had said to them about this child. "All who heard the shepherds' story were astonished, but Mary kept all these things in her heart and thought about them often. Good Morning. What are you hoping for today? Finding that lost cell phone or maybe your lost pet? Finishing your cup of coffee before it gets cold? Hoping to finish your to-do list before you write the next one? Receiving no more unwanted political phone calls today. Will our dear Daisy dog escape once again from her pen? I hope not. I hope the bouncy brown squirrels will always come to my library window to entertain me. 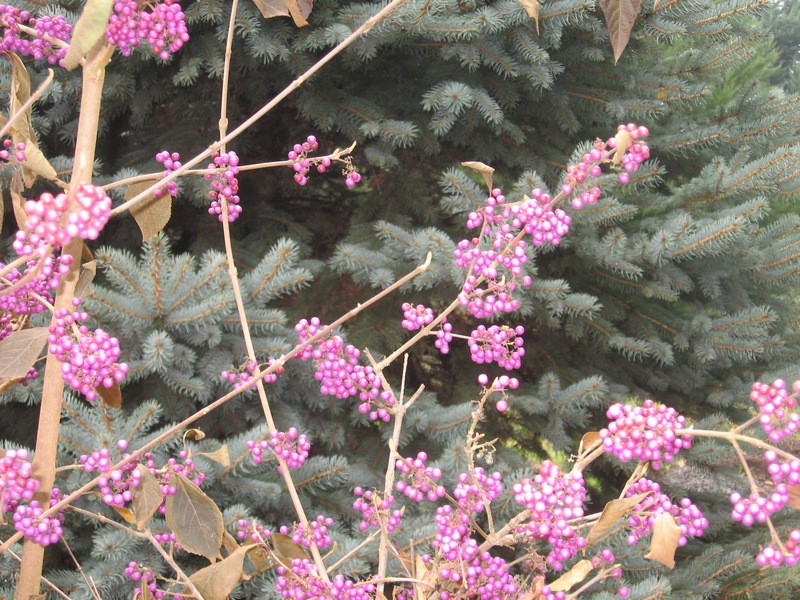 Our American purple beauty berries are in full bloom now. This life is definitely full of concerns, but none mentioned above are very important. I see no eternal value in any of them, except maybe our to-do lists. What activities are truly valuable? I challenge you to make a list starting with faith and ending with love. Joy to the World, the Lord has come! And He is coming again! An exclamation point is the symbol for an emotional or powerful statement. I shout the words again - Joy to the World! 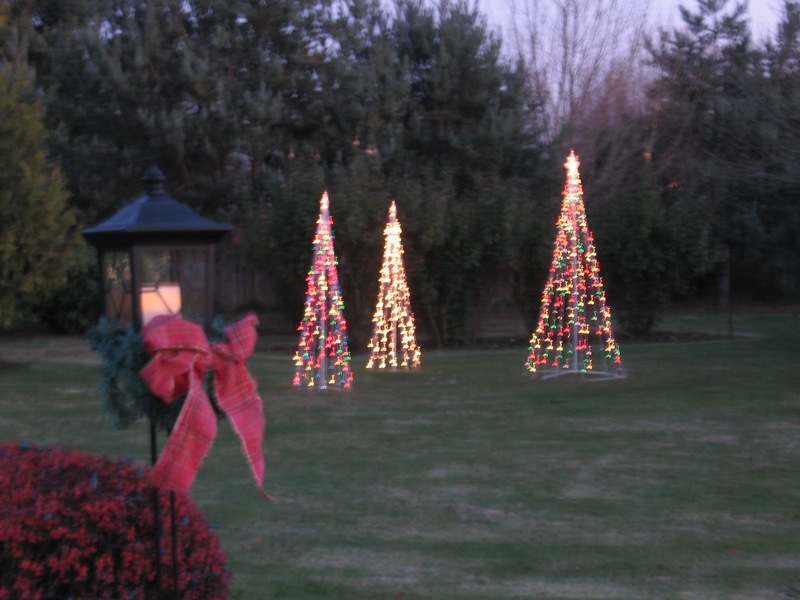 The joy of decorating for Christmas lasts all day or, for a few of us, all week. Do you have a garage full of decorations as my friend, Jewel does? The shelves in our guest bedroom hold many boxes filled with décor, plus the overflow hides in the barn. Thank the Lord for barns! Use this time to reminisce about the people who gave you special decorations. My family and friends gave me awesome treasures that I display every year ~ a giant snow globe from Brad and Dawnita, a large wire angel from Trudy, a glass Christmas tree from Aunt Mildred. Mother gave me an angel dressed in white fir. It now looks suspended over the Christmas tree in the dining room. My cousin, Roberta, gave me several pen and ink Christmas drawings that she drew. I'll find more gems today as I continue unpacking boxes. The view after dark from my library window is a gorgeous site: three multicolored, glowing Christmas trees, one for each of the famous wise men who brought Jesus expensive gifts that night so long ago. Looking for joy? Give three gifts to the needy in Jesus' name. Feeling stressed from your many holiday plans? Sit and rest awhile with me. I will pour us a cup of Lady Grey tea. A special friend, Dianne, came for tea in the library this fine morning. I'm glad you joined us as well. We relaxed in the maroon upholstered chairs and enjoyed the colorful shades of autumn from the window and talked about her unusual sighting of the blue jay in her yard. Blue jays are supposed to stay east of the Rockies, but one came to Marcola for a visit and caused excitement for the local bird lovers. With the dried leaves off the red chestnut tree, the dreadful moss became exposed. Dianne, with her artistic eye, exclaimed how the moss made a beautiful picture. I captured the scene for you and now I must agree with her observation. Another picture to frame. Yesterday, the star magnolia tree wore a green dress. As I looked out the library window today, that same tree displayed half light yellow and half lime-green colors. “What a difference a day makes”. 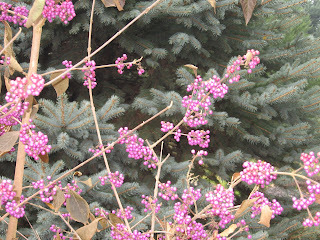 In another week, this tree will become bare except for the fuzzy pussies which announce the promise of future spring flowers. 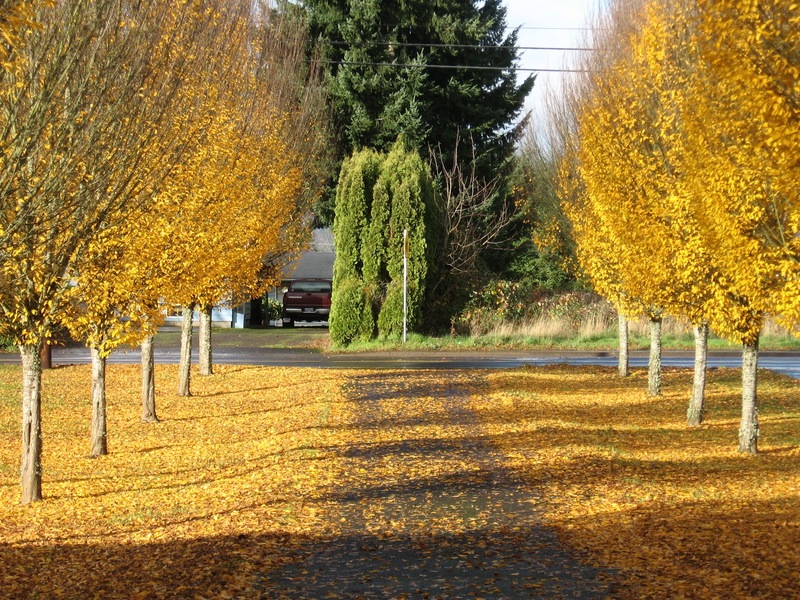 European hornbeam trees line both sides of our long, narrow driveway. The neighbors say people stop and take pictures of the eye-catching scene, especially in the fall. 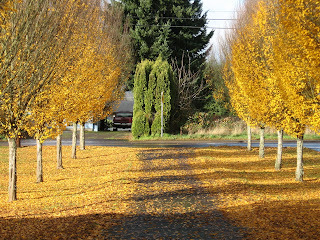 Now the leaves are golden yellow and are so beautiful to see with half the leaves covering the ground and the driveway. The only feature that would make these trees more desirable is if they flowered in the spring. Enjoy your day and your chocolate.